Cancer, diabetes and obesity incidence in pets have increased dramatically in the past few years, and they continue to climb. Commercial pet food, which is very high in calories, directly contribute to the development of these diseases. The solution to this epidemic affecting our pets is making healthier diet choices for our pets, and this is what you will learn here at chefnpaws. 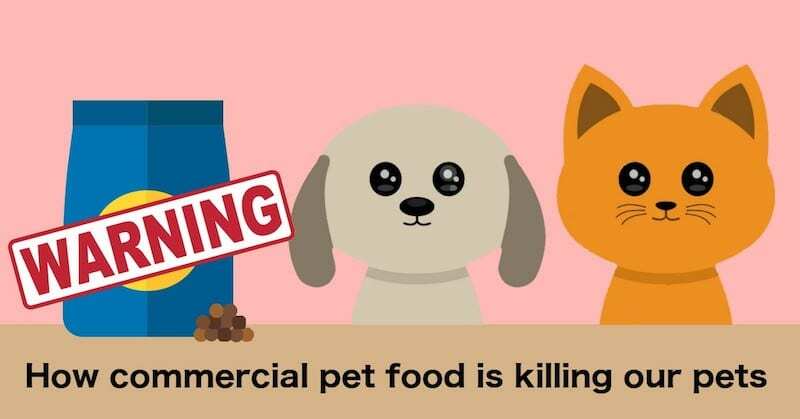 Commercial foods are killing our pets. Approximately 1 of 2 dogs suffer from some type of cancer during their lives. That is a pretty scary statistic. And according to recent scientific studies such as this one, dogs are now the leading mammal species regarding the risk of cancer. These abnormally high cancer rates prompted scientists to discover their cause, and the answers didn’t fail to appear. You might be wondering how the high cancer incidence is connected to the commercial food. Well, according to an extensive study conducted on almost 9,000 animals, the cases of diabetes in both cats and dogs has increased by over 900% in the last decade alone. The study discovered that the risk of contracting diabetes has risen by up to 850% for dogs and 1161% for cats compared to the risk evaluated in 2011. Moreover, the incidence of obesity is higher than ever. A clinical survey conducted in 2017 found that 56% of dogs and no less than 60% of cats were clinically overweight by their veterinarians. By extrapolating these values to the US pet population, it’s estimated that up to 56.5 million cats and 50.2 million dogs are overweight or obese. And the worst part is that this statistic continues to climb. In 1970, the average lifespan of a dog was 17 years. In 2017, this average came down to 10 – 11 years. What changed in the meantime, and what determined this change? The last decades saw a constant increase in the pet food industry’s worth. In fact, even though the pet food industry can trace its roots back to the 19th century, it wasn’t until the 1970’s that pet food companies started to become popular. Today, the pet food industry is crowded and large multinational corporations advertise their products as being the best foods for our pets. But the truth is, these foods were never good for our pets. Most dry foods, also known as kibble, contain a lot of cereal such as rice, barley, and wheat. Kibble contains a lot of calories, which will promote obesity and diabetes, but it doesn’t contain a lot of protein, which should be the main ingredient in our pets’ diet. Since dry food doesn’t seem good for our pets, the solution would be to turn to canned food, right? Unfortunately, even though it does look more appetising than the kibble, canned food is not much better. 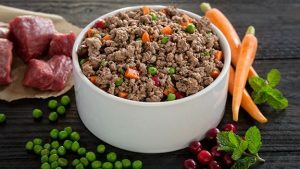 Wet dog food contains a lot of inferior protein, and it doesn’t contain nearly as many veggies as it should. Here is why adding veggies to your pet’s food can be helpful, according to their anatomical needs both cats and dogs need to eat some vegetables in order to lead a healthy life. According to this study conducted in 2005 on almost 100 dogs, adding fresh food to your dog’s diet at least 3 times a week can reduce the incidence of cancer by up to 90%. Jake Perry, an 85-year old from Austin, Texas, is the world-record holder for having the oldest cat. And that’s not all. Mr. Perry has actually managed to hold this record twice. His first cat made it to age 34, and the second to age 38. In fact, according to him, most of Mr. Perry’s cats lived for at least 30 years. Mr. Perry cooks for his cats every day. A typical breakfast for his cats involves eggs, broccoli, turkey bacon and even a dab of coffee with cream. Now, you might think that cooking for your dog or cat can be time-consuming, but the truth is, there are a lot of easy diets you can prepare in just a matter of minutes. The best summer treats for your pets don’t take more than an hour to cook, and most recipes can be refrigerated and served throughout a whole week. We have been led to think that commercial food is good for our pets, but we hope that by now you have a better idea of what’s really going on in the pet food industry. The first step in improving your pets’ health is to implement some dietary changes. Give up the canned food and throw away the kibbles. Cook for your pet. At Chefnpaws we are passionate about giving our pets the best health by making cost effective, quick and easy recipes tailored for our pets nutritional needs. Do you care abut your pet’s health? Are you ready to start giving your pet better food? Enter your details below and you will receive a free PDF with the top 5 recipes you can cook for your cat or dog. You will also receive new recipes every week.